Written for domestic violence advocates, direct service providers, policymakers, and anyone else with an interest in working to improve agency and system responses to domestic violence, the Center Quarterly provides updates and analysis on the latest news and research related to trauma, domestic violence, mental health, and substance abuse, as well as updates on our work at the National Center. To learn more, visit the first edition of the Quarterly by clicking this link: Center Quarterly • Fall 2012. 72% of coalitions reported providing TA to member programs on developing trauma-informed services, and 51% reported providing TA on developing trauma‐informed organizations. Nearly three quarters of the coalitions rated training and TA on trauma-informed approaches and services a high priority. 95% of coalitions indicated that cuts in funding for substance abuse treatment was a “big problem” in their state; 93% indicted that cuts in funding for mental health services was a “big problem” in their state; and 87% indicated that a lack of culturally specific services was a “big problem” in their state, marking this as a major area of need for most coalitions. 64% of coalitions reported being a part of multidisciplinary or multi-organizational state-level task forces/organizations/working groups addressing issues related to mental health, substance abuse, and/or trauma. We were encouraged to learn that coalitions receiving substantial training/TA from NCDVTMH were significantly more likely to (1) feel better prepared to provide training/TA to member programs; (2) provide a range of trauma-informed supports/TA to member programs; (3) be involved in a multi-disciplinary/organizational state-level task force/working group for issues related to mental health, substance abuse, and/or trauma; and (4) have connections with culturally specific organizations. We found no significant differences in challenges faced by coalitions. The Center will soon be offering assistance to the 56 coalitions in developing and conducting baseline needs assessment surveys of their member programs and analyzing the data. The results from The Domestic Violence Coalitions’ Needs Assessment Survey will inform our work as we develop strategies to assist coalitions in supporting their member programs to do trauma-informed work with survivors. As part of our efforts to meet the needs of the 56 coalitions for training and TA on supporting their member programs in doing trauma-informed work, NCDVTMH facilitated a two-day Trauma Symposium following the National Network to End Domestic Violence (NNEDV)’s annual roundtable meeting held in Seattle in November 2012. In her opening remarks to the Symposium, Marylouise Kelley, PhD, Director of the Family Violence Prevention & Services Program (FVPSP), emphasized the importance of developing a trauma-informed approach to advocacy. However, she also recognized that coalitions would need support during this process, saying that she was looking forward to hearing from the coalitions on what they need to move forward. Presenters from NCDVTMH gave an overview of what it looks like to create domestic violence programs that are fully accessible, culturally relevant, and trauma informed. They also discussed how to apply that approach in addressing more complex needs of survivors and their children, including mental health and substance abuse-related needs. Presenters and coalition staff also identified ways that a trauma-informed approach is consistent with empowerment-based domestic violence advocacy. For example, a key element of trauma-informed thinking is exemplified by the shift from asking “what’s wrong with you?” to asking about “what happened to you?” and what you have done to survive. Symposium presenters and attendees discussed how our own responses to trauma, both as individuals and as organizations, can impact survivors and children. An important part of providing trauma-informed services includes reflecting on our own responses and experiences, so that we can work to “embody the kind of world that we want to create,” as Carole Warshaw, MD, Director of NCDVTMH, described it. In addition, participants emphasized the need to collaborate with other agencies and the community as a whole in order to both meet the complex trauma-related needs of survivors and their children and work toward violence prevention and an end to the conditions that create trauma. Many survivors experience intimate partner violence in the context of a lifetime of trauma, including childhood abuse or prior sexual assault, as well as experiences of oppression and trauma related to poverty, discrimination, colonization, and immigration. For example, Gwen Packard of the National Indigenous Women’s Resource Center (NIWRC) explained that most Native women experience multiple traumas over the course of their lives, and virtually all experience the effects of historical trauma. For these reasons, NIWRC and culturally specific programs serving Native women have always taken an approach to advocacy that is informed by an awareness of these interrelated trauma experiences and that incorporates a more collective approach to healing. “Without a trauma lens, services can be retraumatizing, but without a domestic violence lens services may be endangering, without a culture lens, services may not be relevant or helpful, and without a social justice lens programs may be not be inclusive or accessible,” said Dr. Warshaw. Thus, although the central focus of the symposium was on developing trauma-informed approaches to advocacy, presenters and participants emphasized the need for a more holistic framework. “Without a trauma lens, services can be retraumatizing, but without a domestic violence lens services may be endangering, without a culture lens, services may not be relevant or helpful, and without a social justice lens programs may be not be inclusive or accessible,” said Dr. Warshaw. In her presentation, Susan Blumenfeld, MSW, LCSW, NCDVTMH Child Trauma Training Director, explained how for survivors who are parenting, trauma-informed advocacy services must incorporate a family-based perspective. When we see that the parent’s well-being and child’s well-being are interconnected, we can shift our approach to one that fosters resilience and healing for both parent and child and strengthens the parent–child relationship. The symposium also addressed ways to begin doing the work of developing the capacity of member programs and building cross-system collaborations. Representatives from the state coalitions of Kansas, West Virginia, Alabama, Idaho, and Delaware, who have been working with NCDVTMH for a number of years, along with representatives from Alaska and Ohio, who have also been focusing on developing the capacity of member programs to do trauma-informed work, facilitated panel discussions on strategies that they have used to accomplish these goals. Topics covered by the panels included the role of the coalition in supporting member programs in their efforts to become trauma informed, how to build collaborative relationships with mental health and substance abuse agencies at the state and local level, how to integrate trauma-informed principles into accreditation standards, and other topics such as the safe use of technology to connect survivors in rural communities with mental health counselors. Peggy Brown of the Alaska Network on Domestic Violence and Sexual Assault (ANDVSA) and Patti Bland, MA, CDP, who joined NCDVTMH in January after 10 years at ANDVSA, described work done in their state. They highlighted work on developing member program capacity to respond to survivors dealing with substance abuse. Mary Fabri, NCDVTMH consultant and previous Director of the Kovler Center for Survivors of Torture, discussed her work with refugees and immigrants who had experienced what she described as the “triple trauma paradigm.” The triple-trauma paradigm describes how refugees and immigrants live through political, gender-based, or other forms of violence in their country of origin; followed by traumatic experiences during the process of relocation; and then hardships and trauma of displacement that come with resettlement in a new location. She also discussed several models being used internationally to provide mental health support through individuals in the community who do not have clinical degrees. She noted that over the course of the next several years, NCDVTMH will be working to explore these models and their applicability to working with survivors of domestic violence. Eleanor Lyon, PhD, head of the Research Work Group at NCDVTMH, presented the results from a Needs Assessment Survey of the 56 coalitions that was conducted by NCDVTMH, in collaboration with NNEDV. Later this year, NCDVTMH will be offering technical assistance to coalitions on conducting needs assessments of their member programs related to trauma-informed work. Conference participants also discussed the importance of building an evidence base for doing trauma-informed as well as trauma-specific work with survivors of domestic violence. With regard to the latter, they acknowledged the challenges of developing approaches to trauma treatment that are multi-dimensional and account for the impact of multiple traumas, as well as ongoing abuse. NCDVTMH is currently exploring existing trauma-specific treatments that are relevant for DV survivors, and will be helping to develop an evidence base for trauma treatment that is responsive to the needs and priorities of DV survivors from diverse backgrounds and communities. Our recently completed literature review is described elsewhere in this issue of the Center Quarterly. In addition, over the next year, NCDVTMH will be working to identify outcome measures for doing trauma-informed work, in collaboration with the domestic violence field. Experiencing domestic violence can have significant mental health consequences. For many survivors, the traumatic effects of abuse can be alleviated with increased safety and support. For others, trauma-specific mental health interventions have proven helpful, particularly when provided in conjunction with domestic violence advocacy. Yet, while awareness of the impact of trauma has grown considerably, access to mental health or substance abuse services of any kind is often limited, much less services that are gender responsive, culturally relevant, trauma informed, and trauma specific. Additional barriers to services exist for survivors who do not speak English or are undocumented, or for whom accessing behavioral health services carries a high level of stigma. Despite these limitations, some DV advocacy programs provide trauma treatment to survivors within their agencies, and others are in a position to assist survivors in accessing DV-informed, trauma-specific services in their communities. Advocates may also be engaged in collaborative relationships with mental health providers through which they have opportunities to infuse a DV perspective into existing mental health approaches. For these reasons, it is helpful for the DV field to be aware of the types of trauma treatments that are currently available, particularly models that are specifically tailored for survivors of domestic violence, and to be aware of both the strengths and limitations of existing evidence-based treatments for trauma in the context of DV. While there are numerous interventions designed to reduce trauma-related mental health symptoms, most were originally developed to address events that have occurred in the past. Many domestic violence survivors are still under threat of ongoing abuse or stalking, which not only directly impacts their physical and psychological safety but impacts treatment options as well. Little has been known about the extent to which existing evidence-based trauma treatment modalities are applicable to, or require modification for, IPV survivors. 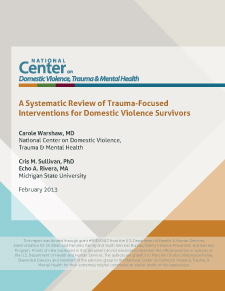 In order to address these concerns, NCDVTMH, in collaboration with Cris Sullivan, PhD, and Echo Rivera, MA, at Michigan State University, conducted a formal literature review of evidence-based trauma treatments for survivors of domestic violence. The paper, A Systematic Review of Trauma-Focused Interventions for Domestic Violence Survivors (see link at left) provides an analysis of nine trauma-based treatments specifically designed or modified for survivors of DV, along with caveats and recommendations for research and practice going forward. Key findings included the following: Trauma treatments that have been modified to meet the specific needs of IPV survivors hold promise for helping women recover and successfully move on with their lives. Additional research is needed to address the domains not examined by these studies, particularly for survivors who have experienced multiple forms of trauma and for survivors from culturally specific communities. While it is too early to know definitively which treatments work best for which survivors, evidence suggests that helpful components may include (1) psychoeducation about the causes and consequences of IPV and its traumatic effects; (2) attention to ongoing safety; (3) cognitive and emotional skill development to address trauma-related symptoms and other life goals and concerns; and (4) a focus on survivors’ strengths as well as cultural strengths on which they can draw. In addition, there are a number of approaches that fall under the rubric of “complex trauma treatment.” Based originally on the work of Judith Herman, MD, in her 1992 book, Trauma and Recovery: The Aftermath of Violence — From Domestic Abuse to Political Terror, complex trauma models offer a more comprehensive framework for understanding and responding to the various effects of chronic abuse as well as a more flexible multi-modal treatment approach. To date, none have been specifically tailored to or studied for survivors of domestic violence. In the long run, however, these models may ultimately prove to be especially useful to DV survivors, particularly those whose experiences of abuse have been more prolonged and severe. Complex trauma treatment models also tend to be consistent with many elements of trauma-informed practice, including addressing safety as a priority, recognizing that symptoms may be coping strategies, and stressing the importance of respectful, collaborative relationships in supporting healing and recovery (Harris, 1998; Saakvitne, Gamble, Pearlman, & Lev, 2000). More holistic, culturally specific approaches for responding to the intersections of individual and collective trauma have also not been studied for survivors of DV. Given that IPV survivors have a wide variety of life experiences with a range of mental health effects, there is no single treatment model that will fit the needs of all. A great deal more research is needed to understand how to respond most effectively to survivors with such a diverse range of needs and experiences. NCDVTMH is engaged in ongoing work to help build an evidence base for trauma-informed and trauma-specific interventions in the context of domestic violence in collaboration with the DV field. Over the next two years, we will be identifying and sharing information about promising practices, conducting focus groups with advocates and survivors from diverse communities about trauma-related outcomes that are meaningful to them and the responses and interventions they find most helpful, and engaging trauma researchers and clinicians in talking with us about their work and its applicability for survivors who are experiencing ongoing abuse by an intimate partner. Harris, M. & Fallot, R.D. (Eds.). (2001). Using trauma theory to design service systems. San Francisco: Jossey-Bass. Herman, J.L. (1992). Trauma and recovery: The aftermath of violence—from domestic abuse to political terror. New York: Basic Books. Saakvitne, K.W., Gamble, S.G., Pearlman, L.A. & Lev, B.T. (2000). Risking connection: A training curriculum for working with survivors of childhood abuse. Lutherville, MD: Sidran Foundation and Press. 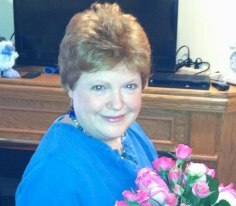 “Advocates Ask,” began as a simple attempt to respond to questions from advocates working at the AWAIC Shelter in Anchorage, Alaska, and Transition House Programs in British Columbia, who wanted to know how to best provide trauma-informed advocacy for women affected by concurrent domestic violence, sexual assault, and substance abuse issues. Their questions and others asked by advocates across the U.S. and Canada on a variety of topics will be addressed for and by advocates in this new column brought to you by NCDVTMH staff member Patti Bland M.A., CDP. Recently I joined the staff of the National Center on Domestic Violence, Trauma & Mental Health (NCDVTMH) to provide training and technical assistance on substance abuse and domestic violence through a trauma-informed lens. Prior to joining the staff at NCDVTMH, I had the good fortune to serve for over 20 years as both an advocate and substance abuse professional in Washington State and as coalition staff for the Alaska Network on Domestic Violence and Sexual Assault. Back in the late 80s and early 90s, it was hard to find a lot of written information on the intersections among domestic violence/sexual assault, substance abuse, trauma, and other psychiatric disabilities rooted in the experiences of survivors themselves. I was so very lucky to connect with Carole Warshaw and other advocates, substance abuse professionals, educators, and coalition staff in Illinois who, early on, were also exploring how to best support survivors experiencing multiple forms of harm. Talking together, we soon discovered advocates in our communities in Illinois, the Pacific Northwest, and Alaska were asking us similar questions about addiction and mental health to help them provide better trauma-informed advocacy for domestic violence/sexual assault program participants in rural and urban areas. Debi Edmund and I wrote our first manual, Getting Safe and Sober: Real Tools You Can Use, as a follow-up to the Illinois DHS manual, Safety and Sobriety, Best Practices in Domestic Violence and Substance Abuse, in response to many of these questions. Both Carole Warshaw and Terri Pease from NCDVTMH provided technical assistance and contributed material to support our efforts to get Safety and Sobriety and other useful Real Tools ready for advocates to use. During these earlier efforts, we hoped to offer practical responses to questions advocates were asking us in our home states about how to support survivors dealing with addiction. Many of these questions (plus new ones) are still being asked today by advocates in rural and urban areas across the U.S. and Canada as well as by program participants themselves. And we find the number of survivors affected by substance abuse who need advocacy, shelter, transitional housing, and other services continues to grow. Between a quarter and half of the women receiving victim services for intimate partner violence (IPV) have substance abuse problems (Bennett & Lawson, 1994; Downs, 2001; Ogle & Baer, 2003). Between 55% and 99% of women who have experienced substance abuse have also been victimized at some point in their life (Moses, et al., 2003) and between 67% and 80% of women in substance abuse treatment are IPV victims (Cohen, et al., 2003; Downs, 2001). These numbers create an overwhelming mandate requiring us to meet the needs of survivors who are affected and often marginalized by substance abuse and substance abuse coercion with even more commitment. It was a hard decision to leave Alaska. Joining the staff at NCDVTMH, though, has been great. The Center helps me share Alaska and Washington’s early work on addiction issues in the context of violence against women. Working at NCDVTMH allows me to stay connected with those who have shared their stories with me and provides a forum for others to share their stories as well. NCDVTMH is committed to ensuring advocates across the country have access to information and tools to reduce service barriers. By working together, we can share ways to provide empowering trauma-informed responses for survivors experiencing concurrent addiction, trauma, and/or psychiatric disabilities. NCDVTMH offers training, webinars, technical assistance, and a range of tools to help support advocacy efforts on behalf of survivors experiencing trauma and barriers stemming from mental illness and substance abuse. We hope this column, “Advocates Ask,” can serve as an adjunct forum to respond to your questions; learn from your experience, strength, and hope; and share resources to better serve survivors and their children. We also hope this column will help advocates explore substance use, abuse, and addiction with us, within the context of other anti-oppression issues. Together we can strive to ensure services, safety, and empowering options are available for all who need our help. It may take time and effort to find colleagues in the alcohol drug field who are both knowledgeable about domestic violence and sexual assault and willing to provide information about substance use from a feminist perspective, especially in rural areas. Taking time to establish local relationships with collaborative partners in the substance abuse field, however, is critical. Substance abuse professionals and women in recovery themselves can provide invaluable guidance and support for both advocates and survivors. Sharing stories, listening, and learning from each other are the best kinds of training and good ways to make friends and build community allies. Along with building relationships with substance abuse professionals and peer support folks, advocates can consider taking a basic community college level or other survey course on addiction issues, as well as coursework explaining the physical, emotional, cognitive, behavioral, social, sexual, economic, and spiritual impact of substance use, abuse, and addiction. Women who misuse substances frequently experience bias and stigma and are routinely denied access to affordable treatment due to factors beyond their control. These barriers stem from “addict-phobia,” which is an unacceptable form of marginalization and oppression experienced by those who struggle with life problems stemming from alcohol and other drug use. Advocates also benefit from training designed to help them become aware of their own feelings about substance use, misuse, and addiction as well as how those feelings affect both themselves and the people they serve. Advocates tell us they serve others best when they have a clear understanding of program policy and knowledge of local substance abuse resources. Most critically, advocates also tell us they need training to know what to say and how to respond in a trauma-informed manner when substance use is an issue. The Center provides an array of tools to help us find the words we need to talk about these challenging issues. It is crucial for advocates to clearly understand how substance use impacts an individual’s safety, as well as how to accommodate survivors in an empowering and non-judgmental manner. Advocates benefit from ongoing training pertaining to substance abuse issues because substance abuse affects a program participant’s safety, empowerment, and capacity to benefit from services. Accommodations are necessary to reduce risk from an abuser who may use substances as a tool to gain or maintain power and control, as well as to support a survivor who identifies their use, misuse, or substance dependence—or that of a partner or other family member, etc.—as a concern. Real Tools: Responding to Multi-Abuse Trauma—A Tool-Kit to Help Advocates and Community Partners Better Serve People with Multiple Issues by Debi Edmund, M.A. LPC and Patricia J. Bland, M.A. CDP for the Alaska Network on Domestic Violence, 2011. Available online at: http://www.nationalcenterdvtraumamh.org/publications-products/responding-to-domestic-violence-tools-and-forms-for-mental-health-providers/ and also at: http://www.andvsa.org/publications. Getting Safe and Sober: Real Tools You Can Use—An Advocacy Teaching Kit for Working with Women Coping with Substance Abuse and Interpersonal Violence by Debi Edmund, M.A. LPC and Patricia J. Bland, M.A. CDP for the Alaska Network on Domestic Violence, 2005. Available online at: http://www.andvsa.org/publications. Safety and Sobriety: Best Practices in Domestic Violence and Substance Abuse, Domestic Violence/Substance Abuse Interdisciplinary Task Force of the Illinois Department of Human Services, January 2005. Available online at: http://www.dhs.state.il.us/page.aspx?item=38441. (only English version). Reducing Barriers to Support for Women Fleeing Violence: A Toolkit for Supporting Women with Varying Levels of Mental Wellness and Substance Use, 2011. Available online at: the BC Society of Transition House website: http://www.bcsth.ca/content/womens-services-1. As many of you know, NCDVTMH responds, one day at a time, to hundreds of technical assistance requests each year. Yet upon listening to advocates we find they themselves often know best what response works well in their own communities. You are a constant source of learning for us. The question and answer above reflects an initial attempt to shed light on complex issues requiring a great deal of thought. Our answer reflects what we have learned from listening to advocates and program participants over the years. We hope you will take what you like and leave the rest. *Note: The question discussed in this column is a composite question drawn from several advocates seeking technical assistance from NCDVTMH over the past few months. To start a discussion, ask a question, share resources or tips, serve as a guest writer or add to the dialogue above, contact Patti Bland, M.A., CDP, via email by clicking this link or call 312-726-7020. Bennett, L. & Lawson, M. (1994). Barriers to cooperation between domestic violence and substance abuse programs. Families In Society, 75, 277-286. Downs, W. (2001). Alcohol problems and violence against women: Report of summary findings. United States Department of Justice, Document Number 188267, Grant No. 96-WT-NX-0005. Ogle, R.L. & Baer, J.S. (2003). Addressing the service linkage problem: Increasing substance abuse treatment engagement using personalized feedback interventions in heavy-using female domestic violence shelter residents. Journal of Interpersonal Violence, 18, 1311-1324. In the last year, it was decided that Parental Alienation Syndrome (PAS) and its offspring (Parental Alienation Disorder) will not be included in the Fifth Edition of the Physicians’ Diagnostic and Statistical Manual (DSM-V). This is very good news for victims of abuse. PAS or parental alienation (PA) was invented as a quasi-scientific theory to refute allegations of abuse by one parent against another in the context of a custody battle. The theory starts from the obvious premise that separating parents are often derogatory about each other to the children. But the theory spins into ideology when it suggests that where children are reluctant to spend time with their noncustodial father, they have been essentially brainwashed by an “alienating” mother. PAS/PA labeling of the mother is routinely used in court to reverse the focus from whether the abuse claims are true, to the assumption that a mother’s abuse claims are themselves a kind of emotional abuse (i.e., “alienation”). PAS/PA thinking thus is used to not only silence a parent who accuses the other of domestic violence or child sexual or physical abuse but also the children’s own feelings and reports, all of which are attributed to the mother’s nefarious or pathological efforts. Sadly, PAS/PA (and similar) labeling has been implicated in the majority of cases where a court has ordered that an abusive parent be given unsupervised access to children. Had the DSM-V included PAS or PAD it would have added enormous financial incentives to the already existing financial remuneration for the many mental health professionals who evaluate and testify about parental alienation in custody litigation. The decision by an objective committee of psychiatric researchers and clinicians to keep it out of the DSM-V, the “bible” of psychiatric medicine, because it is not scientifically valid lends momentum to existing scientific critiques of PAS/PA/PAD and should make it at least a little harder for these theories to be misused in court. Meier, J. (2009). A historical perspective on parental alienation syndrome and parental alienation. Journal of Child Custody, 6(3-4), 232-257. Available at http://www.dvleap.org/LinkClick.aspx?fileticket=dUauj0V-0Fs%3D&tabid=181. The Sandy Hook tragedy has raised a number of issues that have implications for DV advocacy work, including issues related to gun control1 and mental health services. President Obama’s plan includes several initiatives related to mental health, and several states have launched their own initiatives as well. While improving the mental health system—which has suffered devastating cuts over the past several years—is critical, national conversations about the need for mental health care have sometimes reflected stigma and confusion about mental illness and dangerousness. As initiatives to reform the mental health system move forward, DV advocates can play an important role in allying with mental health advocates to counter stigma related to mental illness, while also working to ensure that reforms do not have unintended consequences for survivors of domestic violence. For example, while many initiatives are designed to increase access to mental health services, some also include efforts to heighten the duty of mental health professionals to report on patients and to lower the thresholds for involuntary commitment.3 Proposals such as these risk perpetuating stigma related to mental illness and some may also have unintended consequences for survivors of domestic violence, particularly those whose partners use the mental health system to control and undermine them. Being thoughtful about how the mental health system works to assess and respond to potential dangerousness also includes being responsive to DV-related risks. Mental health agencies should be involved in ongoing collaborations with local DV agencies to ensure that they are prepared to screen for and respond to DV-related risks. Furthermore, while initiatives to prevent violence are critical, supporting those who are affected by violence must also be a national priority. The DV field brings extensive experience supporting the mental health and well-being of those impacted by violence. A number of state coalitions have developed resources for responding to DV-related homicides that would be relevant to efforts to support survivors of tragedies such as the recent Newtown shooting. President Obama and officials in a number of states have also called for changes related to school safety and for school-based interventions, including increasing access to mental health services for students and young people. This is also an area where the DV and trauma fields can provide valuable input, particularly those in the field who have expertise working with children and youth exposed to violence. For example, one of the initiatives called for in President Obama’s plan is Project AWARE (Advancing Wellness and Resilience in Education), which is designed to train teachers and other adults to recognize when young people might need mental health services. This initiative includes offering “Mental Health First Aid” training to teachers, as well as other strategies for making sure that students with signs of mental illness are encouraged to seek mental health services. From our own experiences and from studies such as the Adverse Childhood Experiences study, we know that many children and young people experience high rates of adverse and potentially traumatic events in their lives—and that they may be exposed to ongoing violence at home, in their schools, in their communities, and in their dating relationships. For this reason, any effort to build the skills of teachers and other adults to support the mental health and emotional well-being of young people will be most effective if it incorporates an understanding of the prevalence and impact of both past trauma and ongoing violence, including exposure to domestic violence at home. President Obama’s plan does acknowledge the effect that exposure to community violence can have on mental health, as well as the increased likelihood that children exposed to community violence will later commit acts of violence. The plan calls on Congress to provide $25 million for student “mental health services for trauma or anxiety, conflict resolution programs, and other school-based violence prevention strategies,” but this amount is tiny relative to other national spending and given what we know about the prevalence of violence and trauma. As federal and state initiatives launched in response to the Sandy Hook tragedy continue to develop, the DV advocacy and trauma fields can provide critical input in a number of areas related to the impact of trauma and exposure to violence. It is also important to ensure that reforms do not have unintended consequences that would be harmful to survivors, and that domestic violence safety is incorporated as changes are made to mental health-related laws. We can also play an important role allying with mental health advocates in rejecting stigmatizing approaches to addressing trauma and mental health. However, while it is important to provide input on all of the various proposals being developed to reduce violence, it is also important to take this opportunity to continue to expand and deepen the conversation to address the root causes of violence, which are multiple and complex but also interconnected, and to continue to build and maintain our vision for a more peaceful society. Changes related to gun control called for in President Obama’s plan include a ban on assault weapons and high-capacity magazines and a number of initiatives related to strengthening background checks. The plan also calls for an end to the years-long “freeze” on gun violence research, which resulted from a claim made by some members of Congress that a statute prohibiting federal agencies from “advocating or promoting gun control” meant that they were also prohibited from conducting research on gun violence. Lindstrom, W.W. (Jan. 22, 2013). Remarks to the House Democratic Gun Violence Prevention Task Force. Retrieved from: http://www.mentalhealthamerica.net/index.cfm?objectid=642015AC-E398-BDA6-12E74FB2A2B1BE27. For a summary of President Obama’s Plan to Reduce Gun Violence and a link to the full plan, see http://www.whitehouse.gov/issues/preventing-gun-violence#what-we-can-do. For information about the Mental Health Parity and Addiction Equity Act of 2008 (MHPAEA), visit the website for the Parity Implementation Coalition at http://parityispersonal.org/. For information on guns and domestic violence, see The Facts on Women, Children and Gun Violence by Futures Without Violence, available at http://www.futureswithoutviolence.org/content/action_center/detail/754 and look for the link to the PDF on the right hand side. For information on DV-related gun laws in your state, see Domestic Violence & Firearms Policy Summary, developed by the Law Center to Prevent Gun Violence, available at http://smartgunlaws.org/domestic-violence-firearms-policy-summary/. A link at the top of the page directs readers to a page with individualized descriptions of the DV-related gun laws in each of the 50 states. For an editorial by Jim Parsons, director of the Substance Use and Mental Health Program at the Vera Institute of Justice: Parsons, J. (Jan. 18, 2013). Improve care for its own sake, not for safety. New York Times. Available at: http://www.nytimes.com/roomfordebate/2013/01/17/can-mental-health-care-reduce-gun-violence/improve-mental-care-for-its-own-sake-not-for-gun-safety. Over the past 30 years, there have been numerous studies documenting the health and mental health consequences of domestic violence. Intimate partner violence (IPV) can play a significant role in the development and exacerbation of mental health conditions, lead to poorer physical health, and influence the course of recovery from psychiatric illness. Many IPV survivors also experience multiple types of trauma over the course of their lives, putting them at even greater risk for these effects. A trio of recent research reviews explores these associations between IPV and mental health and their implications for mental health practice. One article in the International Journal of Family Medicine reviewed 75 studies published between 2006 and 2012 on the physical and mental health consequences of IPV. Situating the review in a framework defining IPV as a major human rights and public health problem, it included studies across a wide range of cultures, ages, and settings. Results of the studies reviewed show that experiencing IPV is associated most notably with depression, PTSD, anxiety, suicidal thoughts, self-harm, and sleep disorders. The authors also found that, across studies, experiencing more types of abuse (physical, sexual, emotional/psychological) and abuse of greater severity or duration increased the likelihood of developing one or more of these conditions. This article reviewed both longitudinal and cross sectional studies. Cross-sectional studies, or studies conducted at one point in time, make it difficult to determine causality (i.e., whether having a mental health condition increases one’s risk for being abused, or whether experiencing abuse increases one’s risk for developing a mental health condition). However, the authors note that in the longitudinal studies they reviewed (studies conducted over an extended period of time), IPV preceded the development of these conditions, and the post-IPV rates were similar to those in many of the cross-sectional studies. This increased their confidence that the high rates of depression, PTSD, and suicidality are more likely to reflect the traumatic effects of IPV. A second article published in the British Journal of Psychiatry reviewed 42 studies on the prevalence of IPV among women and men receiving inpatient and outpatient mental health treatment. After pooling the data, researchers calculated a median prevalence (i.e., middle score) of 30% for lifetime IPV exposure among women receiving inpatient mental health treatment, and a 33% prevalence of lifetime IPV exposure among women receiving outpatient mental health services, indicating high rates of IPV among women seen in a range of mental health settings. A third recent review analyzed data from 41 high-quality studies on the prevalence of IPV among people with mental health conditions. As compared to women without a mental health diagnosis, on average, women with depression were 2.7 times as likely to be victims of IPV, women with an anxiety disorder were 4.1 times as likely to be victims of IPV, and women with PTSD were 7.3 times as likely to have experienced IPV. Because of the limited number of high-quality studies available, the researchers were not able to provide similar information about other mental health conditions, including schizophrenia, eating disorders, and bipolar disorder. This knowledge has important implications for both the mental health and DV fields. These articles confirm that many women seen in mental health settings have been (or are currently being) abused by an intimate partner. Thus, routinely inquiring about IPV and mental health coercion and responding appropriately when IPV is disclosed are critical to ensuring that mental health services are responsive to survivors’ needs. In addition, these articles highlight the need for culturally relevant, DV-informed, trauma-specific treatment services (see NCDVTMH’s Literature Review of Trauma-Specific Treatment in the Context of Domestic Violence). These reviews also have important implications for those who work to end IPV and violence against women. In order to best support the safety and well-being of survivors, it is important for advocates to be aware of the mental health effects of abuse and ways that abusers use their partner’s mental health status against them. These articles also underscore the importance of DV programs being fully accessible to survivors who are experiencing mental health conditions or psychiatric disability. NCDVTMH offers training and technical assistance, as well as a number of tip sheets and resources, available on our website, to assist DV advocates and programs in developing trauma-informed responses to domestic violence.